Have you ever discovered tiny bugs creating a tunnel town in your flour or baking mix? Ever spotted bugs in a box of cereal, found dried up beetle bodies on top of the china hutch or watched a grain weevil pour out of a box of macaroni? If you answered yes, don't worry. You're not alone. No matter how tidy your kitchen is, sooner or later you're bound to run across some pests in your pantry. There are many different insects found in stored food products. Sometimes they arrive after we store food, and sometimes they arrive in it. Because these insects are able to reproduce year round, they can appear during any stage (egg, larva, pupa, adult) of their life cycle. Despite strict manufacturing and sanitation practices, it's a fact of life that a certain amount of insects show up in the foods that we purchase. These foods include grains, seeds, dried fruits, cured meats, pet foods, sugar, spices and baking mixes. It can even include our macaroni and cheese (oh, the horror!). Obviously we can never completely prevent pests from arriving in our home via food from the grocery store, but there are things we can do to prevent them from setting up permanent residence in our pantries and cupboards. Clean up food spills (especially grains and pet foods) immediately. Don't allow crumbs and food particles to accumulate. Vacuum your pantry periodically. Wipe down pantry shelf paper (including underneath it). Don't use bleach, ammonia or other strong detergents in food storage areas-they won't affect the insects. Wiping down shelves with hot water and a mild detergent is sufficient. Keep bird food and pet food in airtight plastic containers. Do not purchase boxed foods if the carton appears to have been damaged in shipping. Inspect packages carefully and make sure bags and cartons are well sealed. Frequently inspect food for possible infestations. Remove any infested foods from the pantry immediately. Use older pantry foods first before opening new packages. Pantry insects can easily chew through plastic wrap, wax paper and cardboard. 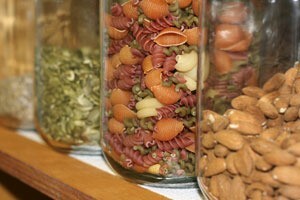 Remove pantry foods from their original containers and store them in glass or plastic containers with airtight seals. Store flour and other cold foods in the refrigerator or freezer to keep bugs out. Purchase only as much food as you will go through in a short time. Try to use cereal and grain products within two weeks of purchase. Place foods in the oven (pet foods, dried peas and beans, for example) at 140º F for 1 hour to eliminate pests. If pest problems continue, seek assistance from a licensed professional. I have this 'wormy thing' in my house! It crawls out of it's 'fuzzy shell' and moves on. It's tiny, but you can see the empty shells. I found one of the worms today cleaning in my daughters room.....they get in everything..not just food!! I have found that if I use a lot of bay leaves around, they will stay out. (I can see why, I don't even like the smell of them!) I have to keep all my packaged foods either in the refridgerator (which takes a lot of space) or in sealed tubs in the basement. Does anyone have any idea what these things are and a better way to get rid of them? Gross!!! I recently read if you put a bay leaf in your flour container the pests will not appear and it doesn't affect the flour's taste. "Place foods in the oven (pet foods, dried peas and beans, for example) at 140º F for 1 hour to eliminate pests. " WAAHHHH???? I don't think I would be eating any peas or beans that had been in an oven to kill bugs! What is the purpose of this? Am I missing something? Great ideas! Here in the arid desert SW, we don't have a huge problem with pantry pests but the one thing I do is put grain products into the freezer for a day to keep anything from developing; forgot a package of mac and cheese one time....ugh, gross! I suffer from life threatening asthma which makes insect control a rather careful process for me. Sprays and other poisons are pretty much out. My exterminator uses something that has never affected me but he does not treat for moths or their larva. Partly due to living in Florida which is conducive to all sorts of insect life and partly due to buying bird seeds, squirrel foods and dog and cat kibble in bulk, I am constantly guarding against "pantry moths." I'm pretty successful with avoiding or at least containing them in food brought in, but being Florida, occasionally someone going in or out at night will let some of the nasty little things in the door since they evidently fly wild around here periodically. Of course they make a beeline for the pantry and for any other food storage shelves including the emergency [hurricane] supplies. I have not had much success with bay leaves or other spices but I have found that the moths tend to light on the ceiling and high on the walls. Their natural defence against the birds and lizards that normally prey on them is to drop when threatened. Using that habit against them, makes it easy to catch and kill them simply by filling a very tall plastic "beer bone" stein that I found at a thrift store with water laced with a few drops of dishsoap. I either lift the stein up agaist the celing trapping the moth within the circle of the rim and gently move the stein across the ceiling until the moth either becomes frightened or crowded by the rim. In either case it will drop into the soapy water and die. If the moth is on the wall rather than the ceiling I just scoot the edge of the rim up the wall toward them and they usually drop in. I know this must sound very tedious and it is. (I'm also not crazy about killing them individually rather than spreading an anonymous poison.) However this is the only method of controlling them that I have found that really works and does not afect my own ability to breathe. I've used dry bay leaves in my kitchen cupboards for years & it works ! I take the leaves from the container & just throw them in whole.